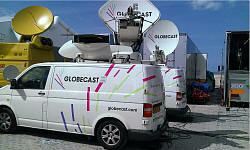 Globecast France: broadcaster transmission services. 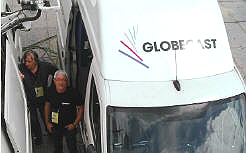 both ad-hoc services as well as international coverage for the host broadcaster for June 6th. The Allied landings – one of the most significant events of WW2 – were commemorated on June 6th in France. Across Normandie there’s a huge range of additional events that have been organised to ensure that the events of 70 years ago live long in the memory. Globecast supplied the international host broadcaster signal and all the main pool signals from the main commemoration sites. It also had three stand-up positions for ad-hoc clients who wanted to cover the event, including complete transmission services as required.